Get the most out of your locks and door hardware. 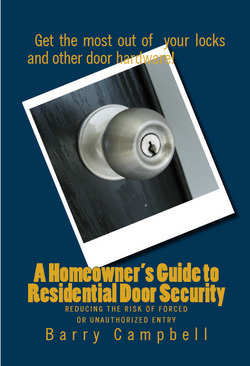 This guide to residential door security describes how to make the door, lock, and wall act as a single unit to best defend against forcible entry. Common lock problems are addressed, and solutions provided. Door construction and installation is addressed. Proper lock installation and operation are detailed, as are simple steps to take in order to reinforce the weakest points. Barry Campbell is a graduate of Valparaiso University with a degree in Criminal Justice. He has worked in private security, investigations, and loss prevention. He is the owner of Altic Lock Service in Indianapolis, Indiana and is a working locksmith. Barry is a member of the Society of Professional Locksmiths and is devoted to the protection of lives and property. In "Residential Door Security," he uses his experience to point out common problems found in new construction as well as older homes.